4 AVAILABLE NOW ON PRE-RELEASE AND WE ARE DROOLING AT THE MOUTH. Henderson Mowers is lucky enough to get 4 on pre-release for customers. If you want one put a deposit to secure yours now! They have been trialed and tested in Australia! One of the contractors that had the luxury of trying one out physically stated that the only way you are getting this saw off me is if you pry it out of my hands when I'm dead! Well, I don't even know where to start. Mankind during its time on the earth has built and constructed mouth watering things but nothing sends a shiver down my spine more then Stihl's new MS 462 C-M chainsaw. You've just gotta have it! Hits full revs in 0.3 seconds, in comparison to the MS 461 which takes 0.7 seconds! It's the lightest high performance saw in the 70cc class making it a must have for all chainsaw enthusiasts. The new rollematic ES lightweight bar is the lightest 20" bar ever made by Stihl and it definitely does not come at the cost of durability and strength. It is designed for felling and pruning in medium-density and high density stands making it perfect for the individual that is using it commercially or cutting a large amount of firewood for personal use. Even for the bloke that just wants the best saw on the market even if he's only cutting wood for a fire in his shed. Hell, I live in a two bedroom unit in town and I'm buying one just to cut my one meter pittosporum hedge. 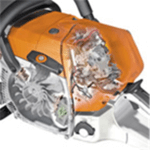 Fitted with Stihl's exceptional M-Tronic technology it delivers better tuning, a better cut and better efficiency. The HD2 filter is also Stihl's best filtration system in the range meaning this saw is built to last. There is so many features to note on this saw so watch the videos and read the specifications and features in detail in the tabs below. They will be in store early August and we only have 4 units during the pre release. The full release is not for a month or so after that. The result of this is a saw which is more fuel efficient while running cleaner. This is due to the the advanced stratified charge system that increases the power of the saw at the same time as minimising consumption. Resulting in increased fuel efficiency which is better for your wallet. Saves 20% of fuel and reduces emissions by up to 70% compared to other Stihl 2-stroke engines!!! This new filter design from Stihl is made from PET material and features a radial seal which prevents the engine from taking in fine dust particles increasing the longevity of the engine and increases the service life. This is why the MS 462 C-M chainsaw is lifting the bar even higher. the calibration of the Stihl M-Tronic system has been optimised even further. It does require the user to make a manual corrections and this is for even areas which are very unique such as high mountain altitudes. Takes roughly 72 seconds for the calibration to be complete after the saw has started. This new oil pump system allows for a larger quantity of oil to be delivered to the bar. This is ideal for dustier conditions if you decided to operate it with a longer guide bar. Using a chainsaw always results is significant vibration causing fatigue for the operator. Thats why Stihl's anti-vibration system is an innovative piece of technology that sets it apart from the rest. The vibration system sees the oscillations from the engine dampened reducing the handle vibration. MS 462 C-M has higher quality vibration buffer points to improve its anti vibration. This revamp of the sprocket cover see's it flatter, narrower and with integrated side rails to reduce the effort needed by the operator when pruning and also ensures a more efficient chip removal. The Stihl MS 462 C-M chainsaw is the lightest profession chainsaw in the 70cc class making it the one to have. 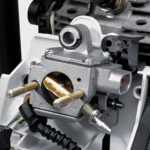 A number of features contribute to this such as the cylinder with its angled cooling ribs, the compact sprocket cover, light crankcase, weight-optimised flywheel and the Rollomatic ES light guide bar. After the machine is turned off it automatically moves back to the operating position to allow for immediate warm restart. Stihl have gotten very technical with the bumper spikes adjusting their length and angle to account for the radial contours of trees allowing it to bite into the wood better then ever. Marking has been put onto the fan cover to assist the operator with plunge cuts. This ensures better directional control and makes the saw a lot safer to use during the process. These Stihl designed caps are tool free and seal perfectly ensuring no leakage.